Nestled on an elevated peninsula of live oaks and southern pines in northeastern South Carolina, between the Intracoastal Waterway and the Cherry Grove Inlet to the Atlantic Ocean, is a place we call home – Tidewater Plantation. This gated community with its focal point being a world class golf course is situated in close proximity to the most beautiful beaches of South Carolina and nearby North Carolina. As a part of the city of North Myrtle Beach, we access the much desired real estate assets of public water, sewer, trash collection and public safety (police, fire, and rescue). Property owners, full time residents as well as seasonal, have in the immediate area highly regarded health professionals. We also enjoy a much sought after cultural environment including local theater presentations, concerts, a symphony, several museums and performances by top rated recording stars and artists with a variety of venues. Residents have access to a wide offering of courses at UNC/Wilmington and Coastal Carolina University. Our own Myrtle Beach Pelicans minor league baseball team, college and high school athletics offer sports fans an outlet to hoot and holler. Real estate at Tidewater presents an array of architectural diversity in our neighborhood home sites. Our single family homes and condominiums have a wide variety of designs and floor plans. There is a size and style to satisfy the housing requirements of any prospective resident. Tidewater has grown from a PUD plan into a community within a community. From the very beginning our residents have been an active, participating segment in the operation and government of Tidewater as well as in the city of North Myrtle Beach. Our active involvement in local politics in the last few years has placed a Tidewater resident on our city council and influenced our mayoral election and produced appointments to city committees. Local and state political leaders seek our input and ideas. On property, our residents are surrounded by a variety of recreational and social amenities. Available for our use, we have five pools, a fitness and exercise center with state of the art equipment, tennis courts, an amenity center, a restaurant, a beach house cabana and the golf course. In addition, our roadways allow for daily walking, jogging or bicycling. Some of us just enjoy viewing the beautiful vistas of tidal marshes and the many boats on the waterway from the deck of our Tidewater Grille. If these are not enough, North Myrtle Beach and Horry County recreational and educational programs are available. Tidewater residents plan many group activities on and off property – tours to local places of interest, group dinners, art shows, aerobics, card nights, to mention a few. Clubs and activities abound at Tidewater such as: bridge clubs, Mahjong, an Artisans group, a Dart Club, knitting and quilting groups, book clubs, many Red Hat groups for the ladies, and even a Red “Cup” group for the men. There is something for everyone! So much to enjoy, so much to do, and only 7 days each week. Life is good! The Tidewater community and its residents are also recognized for their many charitable events and fund raising activities. There are many, but the most well known is the Tidewater Charity Tournament Committee or TCTC. Each year this group raises thousands of dollars through various events held throughout the year at Tidewater, but the most famous is our annual Tidewater Patriot Day Charity Golf Tournament and celebratory weekend which is held over the Labor Day holiday. Over $200,000 has been raised for many charities as well as the awarding of college scholarships and material assistance to injured military. We hope you will join us for this event and for more information on TCTC and the Tidewater Patriot Day Charity Golf Tournament go to TCTC. Tidewater Golf Course has received accolades and high praise since its opening from national publications such as Golf Digest and Golf Magazine as well as positive comments from visiting golfers. As an owner at Tidewater, you are offered annual usage fee programs or special day of play rates. 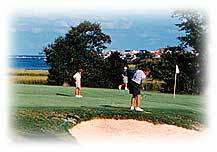 Since the golf course is an integral part of the setting of Tidewater, owners are elated when they hear the favorable comments from visitors and friends about this place. As you peruse the various segments of our website, we hope you can vicariously experience what we have at Tidewater. We also hope that you will make Tidewater not only a place that you will visit but a place to call HOME.